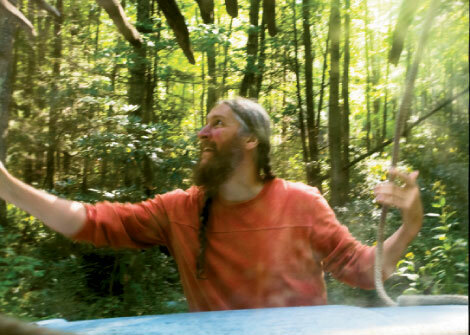 I’m bouncing my way down an historic road in a 130-year-old buggy behind two draft horses and listening as my driver, modern mountain man Eustace Conway, tells me why it’s important for people to hunt and grow their own food, sleep under trees, and learn how to live in direct contact with the wilderness. Jumping from Transcendentalist recitations to squirrel-spotting may seem like the very definition of non sequitur, but to Conway they are strongly connected. He has devoted his life to teaching visitors the beauty and poetry of the natural world at his Turtle Island Preserve near Boone. Here, people from all walks of life, school kids to corporate execs, come to experience a bygone way of life. You’ve probably heard of Eustace Conway. In 2002, the book Last American Man by Elizabeth Gilbert made him famous—if he wasn’t already. The book sparked a compost heap of media coverage. That renown has sprouted widespread awareness of Conway’s story. He moved into a tepee at age 17; earned degrees and “most outstanding senior” status as a buckskin-clad anthropology student at Appalachian State University; performed feats of outdoor prowess, including an end-to-end Appalachian Trail trek where he only lived off the land, and a record-setting horseback ride across the United States. That’s just for starters. Then he founded his back-to-nature education camp Turtle Island Preserve. In the 22 years since, Conway has welcomed thousands intent on learning outdoor skills and experiencing the closer-to-the-Earth lifestyle that he espouses. Of course, Conway has detractors. Gilbert’s book explores naysayers’ criticisms of Conway—some lodged by former associates—for everything from relentless self-promotion, to hypocrisy, to charges of being difficult and self-centered. But riding in this cart, conversation comes easy with this charismatic guy, and I see why paying for a buggy ride with Conway is one of Turtle Island’s most popular ways to get a glimpse of the original do-it-yourself lifestyle. If you could go back to 1845, wouldn’t you spend $65 to take a ride around Walden Pond with Thoreau? Turtle Island is an impressive place, and so is the extensive tour that includes my guides’ wit and wisdom. With a teacher’s soft voice, Conway’s words jump back and forth between philosophy and natural history. Conway couldn’t teach harmonious living with the land unless he had a big chunk of it himself—1,000 acres. Visitors drive in along a spectacular stream, past a sign that reads, “No shirt, no shoes, no problem.” From the parking area, the stream wanders through a broad, heavily wooded valley. The surrounding slopes, rich in mature timber, are his too. Turtle Island reaches over the crests of adjoining ridges—in effect, sealing off the watershed. The tour rolls through base camp, the electricity-free main campus. Conway says the road is centuries old and has been in use since Daniel Boone trod this escarpment to camp and hunt. The road winds past a 1920s sawmill, stone walls, and old foundations. Conway built Turtle Island’s first Blacksmith shop on the site where one had stood a long time before, using the same stones in the process. The massive log building, with multiple hearths and anvils for instruction, has just been completed. “A lot of times people would take their houses apart when they moved,” Conway says while pausing at the blacksmith shop, which explains how the earlier structure on this site came to be in Boone, where it still stands as a barn. Conway heard that story from descendants of the earlier owner, who also gave him a harness that was used on this same property. “I’m still using that harness on this farm 90 years later,” he says. Aiding Conway in the quest to give campers an off-the-grid reality check is a small group of interns who serve one-year apprenticeships to learn outdoor life skills. Recent University of Virginia grad Liam de los Reyes, wants to work with a nonprofit or nongovernmental organization performing agricultural or forestry work in developing countries. “But I didn’t know the front of a tool from the back,” he says. “I could read about solar energy, but here, we’ll be building a solar shower.” He hopes his time at the preserve will give him a practical outdoors foundation to complement his university education. The current cook is an intern learning his craft on open fires. “He wants it on his résumé so he can work on a dude ranch or with a hunting outfitter,” Conway says. “It’s a lot easier to find someone who can flip a burger at Hardee’s than it is someone who knows how to dress an elk tenderloin and cook it on a fire.” Soon a hunting course will be added to the camp’s offerings. I began my day at Turtle Island wondering how someone like myself, who’s explored his share of faint trails, and even blazed a few, would react to meeting a modern-day Daniel Boone. I have to admit, even just clomping down a historic lane in a horse-drawn wagon, one senses this man is deeply connected to the land. After a couple of hours at a buggy’s pace around Turtle Island, that echo of a traditional Appalachian ethos makes a lot of sense. Photography by Tim Hussey Randy Johnson started Grandfather Mountain’s wilderness trail preservation program in the 1970s and is the author of Hiking North Carolina and Hiking the Blue Ridge Parkway.